So the biggest new thing in winter sports is certainly not those pointless snow bikes but instead the much more exciting Splitboarding. Essentially a splitboard is a snowboard that is ‘split’ or cut down the middle to make a pair of rather odd looking skis. What makes the concept so great is because you often have to ski uphill to find the best snow and this is where the splitboard comes into its own, with your split ‘skis’ you can turn around the bindings, add grippy seal skins and just glide uphill on the snow, which makes touring uphill in search of powder, effortless like a leisurely Sunday afternoon walk….. OK I lie it’s still a lot of hard work! After my experience of 5 winter seasons on various splitboards, what are the main pros and cons of splitboarding and should you rush out to by one? 1. Compared to snow shoeing for powder turns you have no weight on your back, neither a snow board for the uphill nor the snow shoes on the down hill. With ‘skiing’ or skinning uphill compared to snow shoeing you don’t lift the weight of the shoes, rather you slide the board and glide uphill. This means a lot less effort and way easier in deeper lighter snow. With ‘skis’ on your feet you can quickly navigate up and down those small undulations that you always encounter while on a tour, sliding downhill is clearly quicker and easier than walking down. 2. 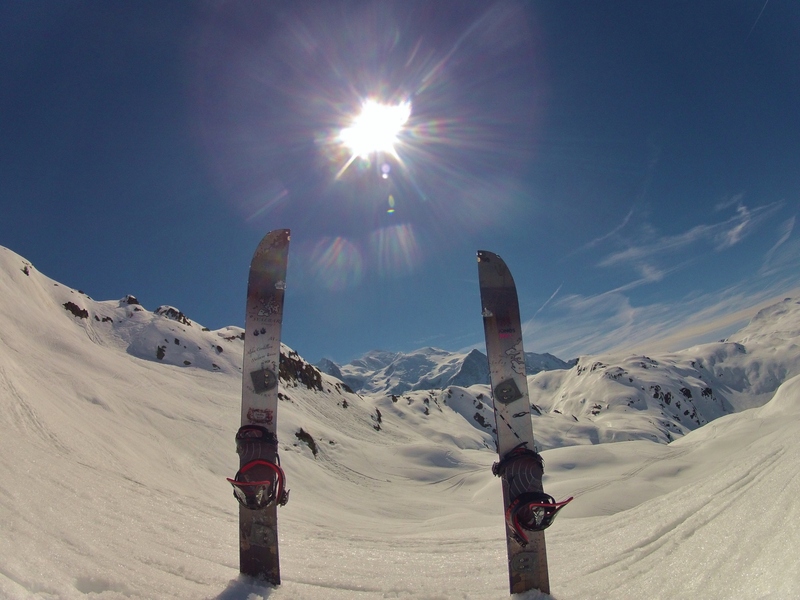 Glacier travel on a splitboard is much, much safer than on snow shoes, (but not quite as safe as on skis still) in Europe a lot of resorts like, Verbier, Zermatt and Chamonix access excellent glaciated off piste and touring routes. Glaciers mean crevasses and in winter snow bridges cover up these crevasses, splitboard ‘skis’ are therefore similar to normal skis and spread your weight better than walking which greatly reduces the chance of falling through the snow bridge into a crevasse and that’s a pretty good thing! However you don’t have the same control as with standard skis due to the assymetrical shape and you can’t ski away from potential danger as easily as touring skiers might. 3. Splitboarding is Better than ski touring for one simple reason: Snowboard boots are way more comfortable than ski boots for touring in! At the end of a tour I feel like I am in comfy hiking boots and have no desire to take them off in a hurry, I try not to be too smug but how many skiers can say that! You do need stiff snowboard boots though, so don’t go using park boots or you’ll have little control when skinning. 4. A splitboard is normally wider under foot, therefore it has more ‘seal skin’ in contact with the snow which means more grip, and more grip means you can go straight up steeper stuff. So no need for that ridiculous French style skier set zig-zagging skin track uphill! 1. Firstly is the price difference over snow shoes, all you need to snow shoe tour is a €50 set of snow shoes and using your normal board off you go (with avy kit too). To contrast that with a splitboard set up which starts at about €1,000, that’s a decent difference! 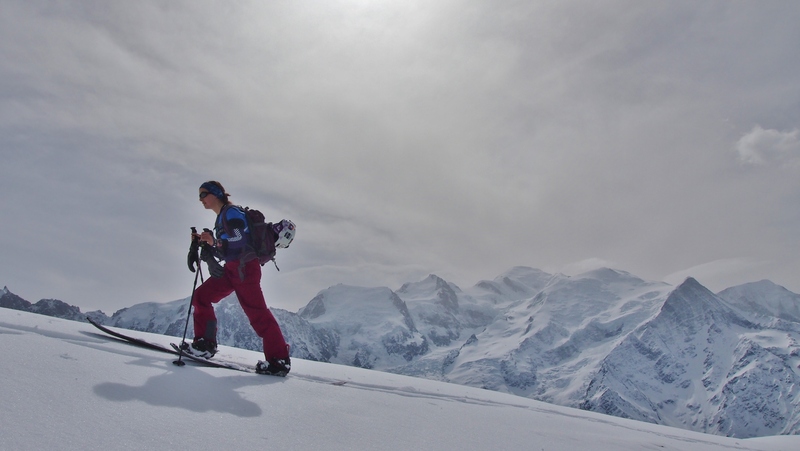 However it does equate to a good quality ski touring package. 2. There are some limitations to splitboard ‘skis’ as I touched on above, firstly they are fatter so they don’t fit in a lot of skier set skin tracks which can be a problem on steep cross slope tracks in hard snow. Unfortunately one foot is normally up-slope above the set skin track and the other lower and that’s a right pain. The other side effect is that the splitboard ‘skis’ curved edge just doesn’t grip the side of a hill like a normal ski does, it has too much side cut and too short, therefore icy traverses can be ‘interesting’ lets say! 3. Splitboards aren’t super light, they are heavier than a lightweight ski touring set up. Don’t get me wrong they’re not crazy heavy and the better board and bindings can be lighter than an all rounder ski touring set-up i.e. with fat skis and Marker type bindings. The added weight of a splitboard is also the only notable difference going downhill. Splitboards don’t ride or flex differently because they’re split, but models tend to be made stiffer due to the fact they will see most use in big mountain terrain when some stiffness is needed for both up and downhill use. They are exceptions that you can buy but generally the weight and profile means splitboards are less good for playing or jibbing than a standard board. 4.Ice is your enemy, this issue also affects quite a few ski bindings; because in springtime you might start your tour in warm wet snow, as you gain height the temperature falls and that wet snow has transformed into solid ice all over your board. This covers all the sliding interface parts that convert the ‘skis’ back into a solid board. It can be quite an effort scrapping and sliding, but saying that I have had to wait for people with certain ski touring bindings to clear even more ice out. Dynafit ski bindings or snow shoers don’t have the same issues! The key benefit of a splitboard for snowboarders is that while it might be a bit less efficient than a high end ski touring set up, it means you get to go snowboarding in the back country more easily and not have to learn how to ski! Remember that buying the equipment should always be followed by taking an avalanche awareness course and slowly gaining experience in the back country with knowledgeable people. Previous articleWhy spring skiing in Chamonix is unbeatable! Just learn to ski. I tried spliboarding for a short time before deciding that outside of near-perfect conditions it was a total pain. The cons here are far bigger than the pros – some of which are highly subjective. I love my ski touring boots, just as comfy to be in as my Nike Zoom snowboard boots. i am decent on skis and advanced on snowboarding, with 4 years on skis and 20 years on snowboards.. ive been getting season passes to the ski resorts over the last 10 years and havent been on skis since i was a teenager..
im seriously considering getting AT skis as they are just so much more efficient as apposed to splitboards… what are your thoughts. i have zero experience with either..
whata u think? i love snowboarding but it sounds like a nightmare compared to AT skiing. can anyone convince me not to go AT SKI? Try them both out, but bear in mind it takes a while to get good on a splitboard. It really depends on terrain you ski, if up and down on mostly powder then splitboard, if lots of undulating terrain on tours then go for skis, remember you can keep poles out on splitboards too for flat sections. We can convert our boards almost as quick as skiers so it’s not exactly a nightmare! dude ski boots are better. you can’t clip crampons or do any kicksteps or cliimbing in snowboard boots. You can use crampons on snowboard boots just fine, various Grivel designs will fit securely and we’ve used G10 and Air Tech Light for lighter aluminium on steep icy terrain. Not great for vertical ice climbing but not sure there’s many routes I’d like to splitboard that involve ice climbing. Again kick steps are fine in snowboard boots, many have hard ‘ice spikes’ in the toes grip to aid this, if snow is too hard for this then we use crampons. For us hard boots like Phantom just ruin the feel and ride quality of why we choose to snowboard in the first pace, you might as well ski tour. A stiff snowboard boot built with splitboarding in mind is fine. I alwasy got a question in my mind. For snowboarding i am sure it is totally fine just not sure can I use the splitboard go for ski in the slope as well? Do you mean how good is it to ski downhill on a split board? If so not very good, kind of like out of control telemark skis. Uphill though is different.